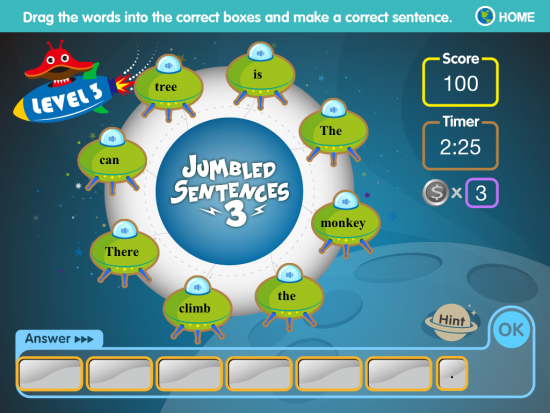 Jumbled Sentences is a series of five free iPad apps designed to help students learn to construct sentences. The apps provide students with drag and drop activities in which they sort jumbled words into sentences. The sound can be turned off and on in each app. When the sound is turned on students can hear the words read them by the narrator. The narrator also reads the sentences that students construct. The app provides students with immediate feedback on each of the sentences that they build. When students correctly create sentences they earn virtual coins that they can then use to buy virtual stickers to mark their progress.